It is around 8 o’clock in the morning and as we drive from breakfast to Guara, the community we are to work in, we are greeted by mist floating in the valleys. The scenery is very soothing and calming that it seems to have stepped out of a painting. When we get to our destined drop off points in order to hike to the more inland communities for our various activities, the dew on the grass and trees cling to our clothes and belongings. As we walk down the valley and hop from root to ground, we discuss strategies on how to approach the community members and make the activities community-led. This has become our daily ritual for the communities are dynamic and always full of surprises – good surprises. 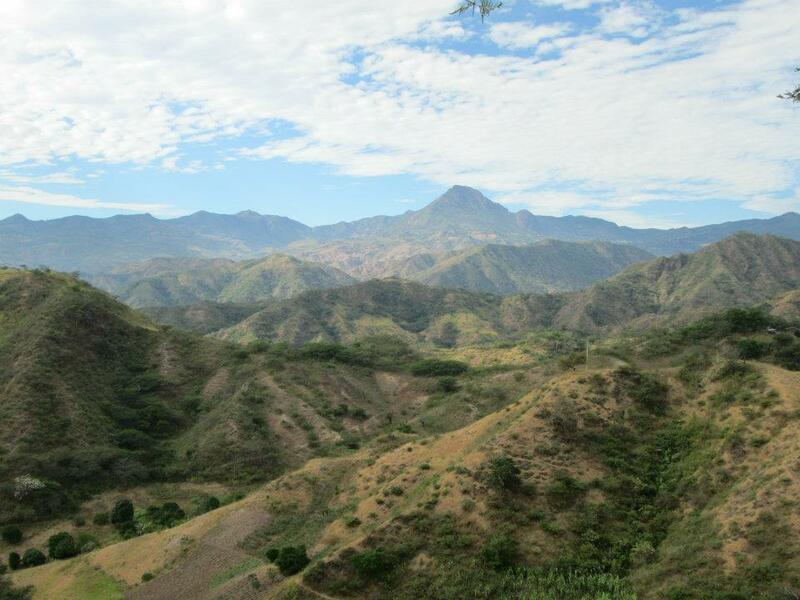 The community of Guara is seated on a very mountainous landscape sweeping beyond what any eye can see. Green mountains hold each others hands as they reach for the horizon and touch the blue sky which is filled with beautiful white clouds. Trees and fields of corn and other crops grace the lee-sides of the mountains dancing to the sway of the breeze. Every person we bypass greets us with such openness and warmth. The dogs seem to be on edge more than ever for they bark out loudly as we approach various yards. We walk eagerly so as to get to our destinations faster, but to get away from the dogs as well. Don Darwin, our local coordinator, assures us that the dogs are more of guards than attackers so there is nothing to worry about. We finally get to one of the houses after about 45 minutes of hiking. We are welcomed very warmly, and even if I personally have no idea what is been said, they are adamant on speaking to me. All I do is smile, nod, and focusing on the facial expressions of the speaker, I speak the little Spanish I know i.e. “si”, “no” and other agreeing sounds. After “talking” for about 5 minutes, our program director rescues me from my masquerade and I carry on to observing the conversation. I presume my crush-course Spanish lessons on YouTube did not pay off. THe challenges of not speaking the language is sometimes frustrating, but the Spanish speakers on the team are patient enough to explain every detail, and always encourage us (the non-Spanish speakers) to always ask questions. I presume by the time the summer is over, some decent Spanish will be spoken by many of us. This only shows that in as much as we are offering something to the communities, they are also giving us something live-sustaining – a new language. 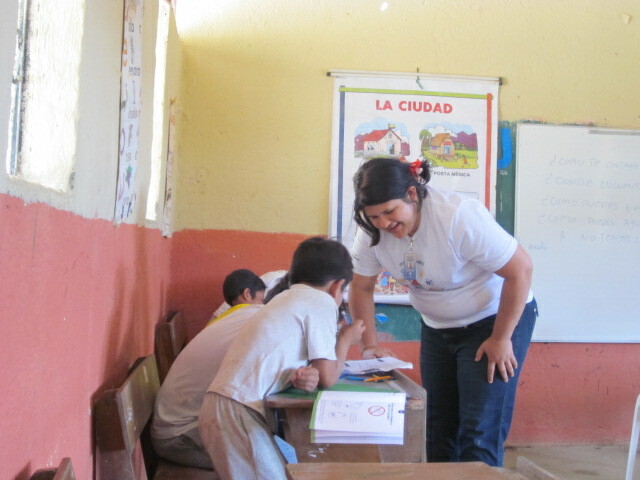 The communities not only offer us the chance to practice Spanish, but their time as well. They are very hard working, and tend to leave their work in order to hear what we have to say. They are very patient and take their time to understand our various projects and usually offer their time to attend the various activities that we have set up. They also inform us how various projects done in the past aid them and that gives them the zeal to want to learn more from the current ones. This makes me realize that without the communities’ full involvement, the projects would not take much root. Am so glad that the communities embrace not only us, but our work as well. This gives us the enthusiasm to woke up each morning to do a great day’s work! Friday the thirteenth, the day we were all expecting with a strange mix of excitement and dread. We were super excited about Healthy Living’s open house. The open house was HL’s closing event, where we would be showcasing what the team and the community members had been working on together for the past few weeks. On the other hand we were dreading two things: the bad luck of a Friday the 13th- which fortunately waited until the event was finished to manifest- and, more than anything, we dreaded the thought of having to say goodbye to the people of Chaquizhca, Guara and Bella Maria. People who had so warmly opened their homes, schools, and their hearts to us. We arrived very early in the morning to set everything up, gosh I had like 300 drawings from the story telling and participatory project I was working on at the local schools. Lucky for me the children arrived shortly and came to my rescue. Later, some folks from our french ally institution Tsiky Tzanaka joined in, and we were done in the nick of time. The party started at around 10 in the morning, it was the perfect mix of a cultural fair and a gathering between good friends. There were booths with local produce and crafts, others with some creative work from the members of the HL team, and some from local partners and institutions. There were interactive activities like the solar clock, which aimed to show community members traditional alternatives to new technologies that have been forgotten; the family photo booth and community photo shows; the balance and jumping ropes for the children. I was in charge of the children’s room, where the drawings from the story telling and participatory sketching activities were showcased, along with art projects from the children’s class work. It was a very nice experience, having people come and explaining what the children and I had worked on for the entire month, why it was relevant and what was next. Later on, there were performances from the children and community members. The best moment for me was when I found out the community members had set up a snack post with traditional Latin-American delights like empanadas and salchi-papas (fries and wienies); I always loved those back in Colombia and had missed them a lot. We concluded the event with a nice lunch and warm goodbyes. The children asked me “Lily, Lily!!! are you coming back next year?” I smiled cautiously and answered “God willing, I will try ” I was sad about the uncertainty of it all, but I felt worse about people who were probably asked the same question, but knew for sure they were not coming back. Still, whether we planned on coming back or not, we hoped that the communities had found our presence as enjoyable as we had found their company, and that our work had impacted their lives at least half as much as it did our souls. Going home, Friday the 13th started kicking in: two vans had flat tires, we encountered all kinds of crazy stuff on the road, but at the end of the day there was nothing but satisfaction in the memory of that day. As we shared dinner and drinks we also shared warm and happy memories, funny anecdotes and jokes about some not so pleasant experiences. The open house had closed, but we hope that the hearts we tried to reach during our time there would remain open. Apart from the display of children’s drawings, there are also other booths of Clinic, Entomology, Mammal, Entomology, Healthy Living, and some agriculture products and souvenirs bought to the Open House by local people. Let’s see what we have for the day. We did the same activities with the school in Chaquizhca. The only difference is that there are many more students in this school than the one in Guara, which makes it more difficult for us to facilitate. 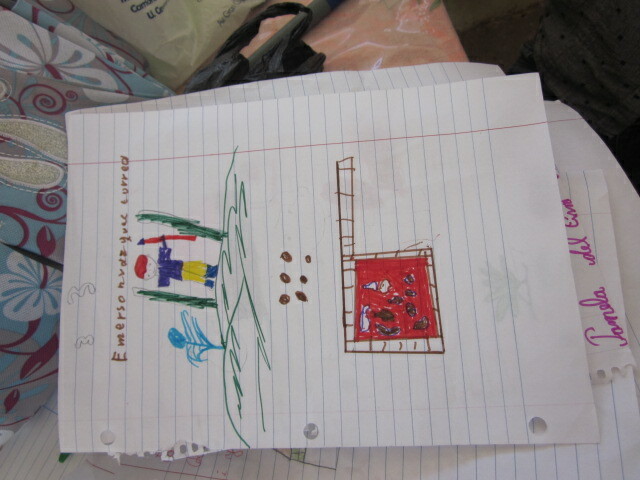 However, we also received quite satisfying responses and beautiful drawings. We are happy with what we have got so far from both schools. There will be another activity in the school in Bella Maria next week and that is supposed to be done with storytelling and participatory sketching this summer. 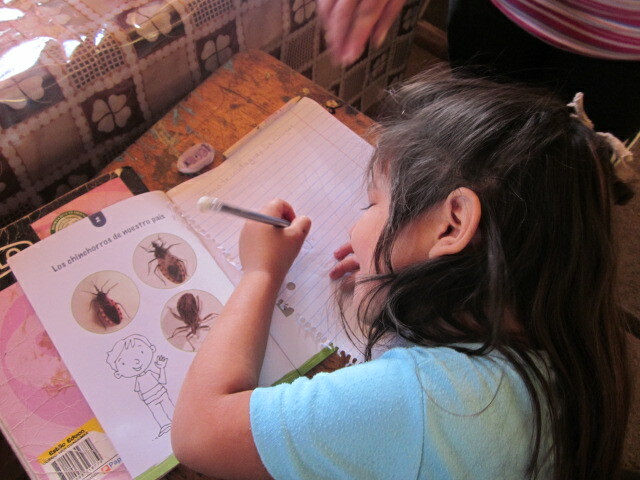 I am glad that we have made some impression about Chagas, which would help them to live healthier. On the other hand, knowing that I will hardly see these faces again after this summer, it is really hard when they come and ask every morning: “When are you coming back to our class?” Although I may not ever come back here to see them draw and color and ask me questions again, I hope they will remember me anytime they look at the booklet and remember the information I tried to remind them of through participatory sketching. That would be the biggest reward ever for me and the Healthy Living team after all our hard work and efforts to get the community to become more engaged in our fight against Chagas disease. I hope what the children have learnt will last long in their memories and will be helpful for them long in their lives. There would be nothing better that I could wish for the children and the communities here, and that is also what I have been trying to do with all my heart. 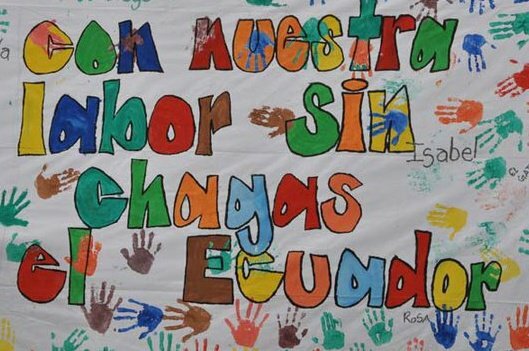 Con nuestra labor, sin chagas en Ecuador!!!! All the participants in the project, both from Ohio University and la PUCE arrived over the weekend, and it seems like the population of Cariamanga, or at least the area we are staying in has risen considerably as a result of their arrival as one cannot walk in Cariamanga without seeing a team member. On Monday we had a meeting in another hotel in Cariamanga with all of the participants where the different components of the project were explained to those who had arrived. Yesterday we went back to the communities, but this time in a whole fleet of different vehicles, school vans (called bananas by the team), SUVs and the tried and trusted pick up trucks driven by Don Victor and Eduardo. 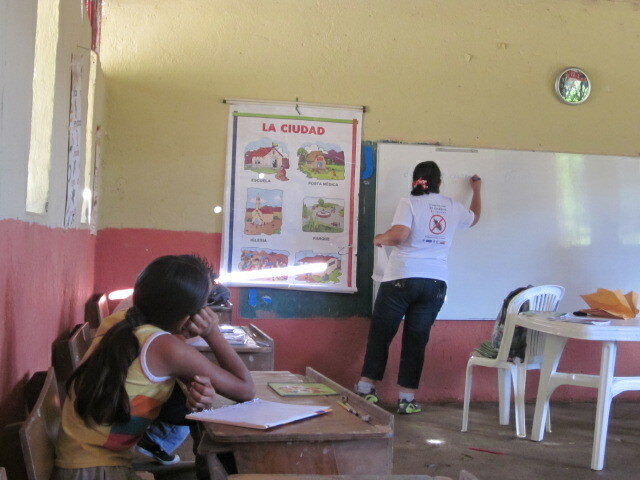 We left Cariamanga at 6 in the morning, after a rally cry led by Dr. Grijalva: “Con nuestra labor, sin chagas en Ecuador!” We arrived at the school in Chaquizca, where members of the Healthy Living team were greeted by students at the school we had worked with in the previous weeks. We had breakfast at the school including cereal, eggs, coffee, juice, bread and fruits; then split up into our fumigation teams to head to Guara. Each team included members of a national health group that works in fumigation, they work both with chagas and malaria prevention, undergraduate students from Ohio University, students from la PUCE and members of the OU Healthy Living team. Our team arrived at Don Milenio’s house in Guara and proceeded to walk up, a direction that we would become very familiar with over 5 hours, to our first houses. We first arrived at the house of Don Sirilo, a very friendly man who welcomed us warmly with lemonade. He had a nice, adobe house and kept chickens and pigs outside of the house. After talking briefly with him and his wife, we went back down the hill to his daughter’s house, where we drank more lemonade, interviewed her with a socio economic survey while the other members of the team looked for chinchorros and fumigated the house. We then went back to Don Sirilo, and while Daniela did the interview, I helped looked for chinchorros. His house was very nice and clean and we found no chinchorros on the inside, however, while walking on the porch I spotted one on the outside wall. The chinchorro had likely just landed there from the fields and bushes near the house, and confirms the theory that while a house may be fumigated regularly, the chinchorros come back from the field to the houses once the danger is gone. We then spent about half an hour taking most everything out of the house so it could then be fumigated. While Marco, a PUCE biology student and John Jack got some good exercise by carrying a full tank of water out of the house, I had to deal with trying to get a defensive hen out of the bodega, trying to calm it down to prevent it from biting me. I tied her up outside of the house, and all the chicks that were inside the bodega before followed her out when they heard her voice. The fumigation was done by spraying the walls with the solution and giving attention to cracks in between walls where chinchorros may congregate. After the fumigation was complete we put the stuff back in the house, roughly where it was before and proceeded to the next house. We took a slight detour through less walked upon paths going up hill over loose terrain to get to the next house, the house of Don Abram, which while classified for the project as part of Guara, is actually part of Luranda, which is in between Guara and Chaquizca. Here I interviewed Don Abram and we also talked about different foods that they eat there and he showed me his gamecocks that he had in bamboo cages, including a few that had already won a handful of fights. No chinchorros were found but the house, as all houses in the project was fumigated as a preventive measure. We then began a long trek back down to the highway, where we passed through woods, a creek, a pasture, where people attending the fields gave us oranges. We bumped into Don Sirilo again, who showed us the way back to the road, and while walking through his property, we saw a irrigation system called séquia, which channels the creek water in small canals above the fields, and when one wants to irrigate an area they dam the canal and make an opening in the side of it. We met up with Dr. Grijalva who drove us back to Chaquizca where we recuperated before taking a “banana” back to Cariamanga. We woke up to a chilly, misty Andean morning to begin our first full day of research in the communities. 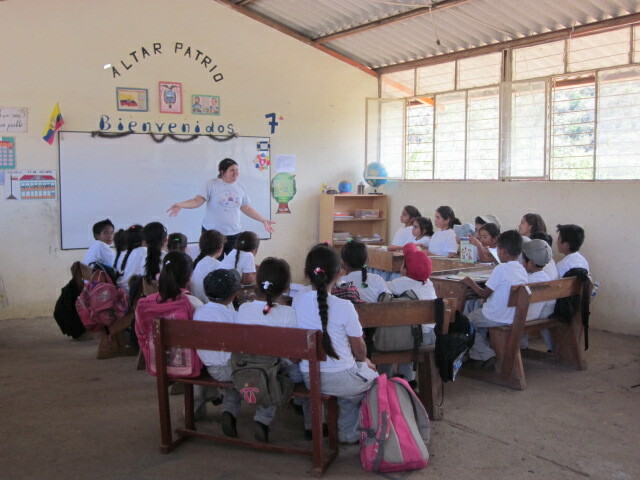 We left Cariamanga for Chaquizca, where we arrived at the school and then split into our different groups to do our designated activities. 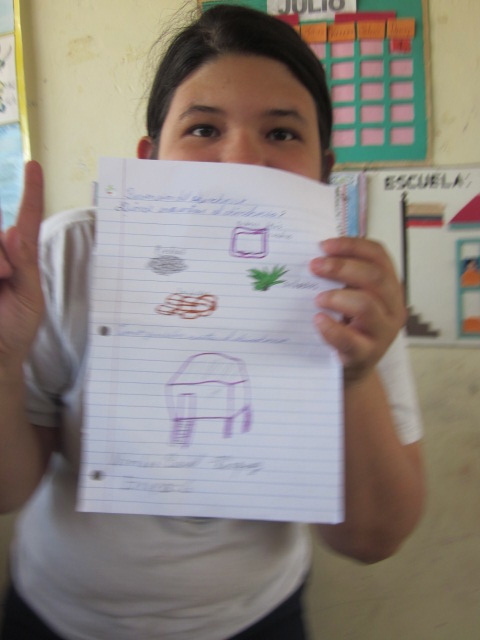 Lily conducted her activity at the school for her project on local stories. 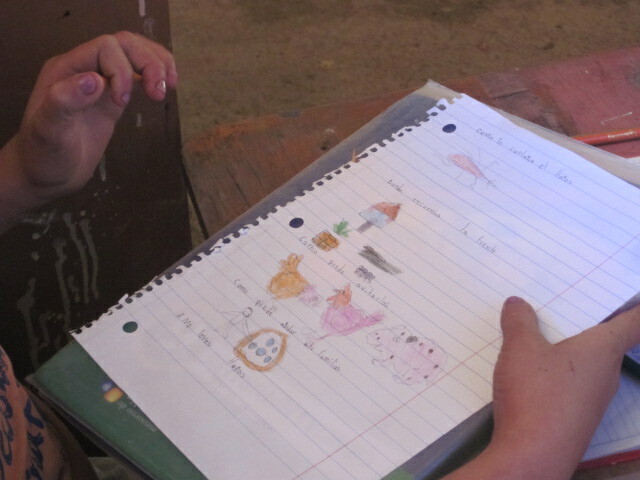 She had all thirty students illustrate responses to the stories that they had compiled the year before as they split into groups and collaborated with each other, using crayons and colored pencils to draw their responses to stories such as La paloma llora and El conejo y el zorro. Lily talked to the teachers who had positive responses to the concept of involving local stories in the curriculum for it inspires critical thinking and pride in their communities. Claudia, Ing. Darwin and I visited two houses in Chaquizca that had consistently tested negative for the presence of Chagas vectors to see if there are common characteristics to their houses that inhibits the vectors from having a presence in their houses. Our first visit was with a man who lived next to the school named Don Alberto. He seemed very aware of the need to prevent against Chagas disease as he fumigates his house regularly and cleans it daily. We then went in the truck to a community on the edge of Chaquizca going back towards the highway. There we met Don José and his family, who were in the process of making a dulce block locally called panela, which is made out of sugar cane that he grows on his property. The process seemed similar to making maple syrup, a large fire is made below large trays where the liquid caña juice is placed in order for it to condense. When it is sufficiently thick, the liquid is placed in block molds to cool. Don José said that the blocks, along with other crops that he cultivates are taken to the ferías libres held in Cariamanga on Sundays. Don José and his family were also very aware of the need to prevent the presence of vectors in their household, claiming that they fumigate the house regularly, keep animals outside of the house and go to the doctor or other place to be taken care of when they feel sick. Miks, Guillermo and Susan went to the house of Don Fernando, a large landholder in the community of Chaquizca. They went on a long drive through the land and met up with him in an orange grove on his property. According to Miks, they ate the best oranges that photosynthesis has ever produced they talked about his impressions of the community and the project. He emphasized that education was important for the community and also that he was interested in giving legal status to the farmers who lived on his land. 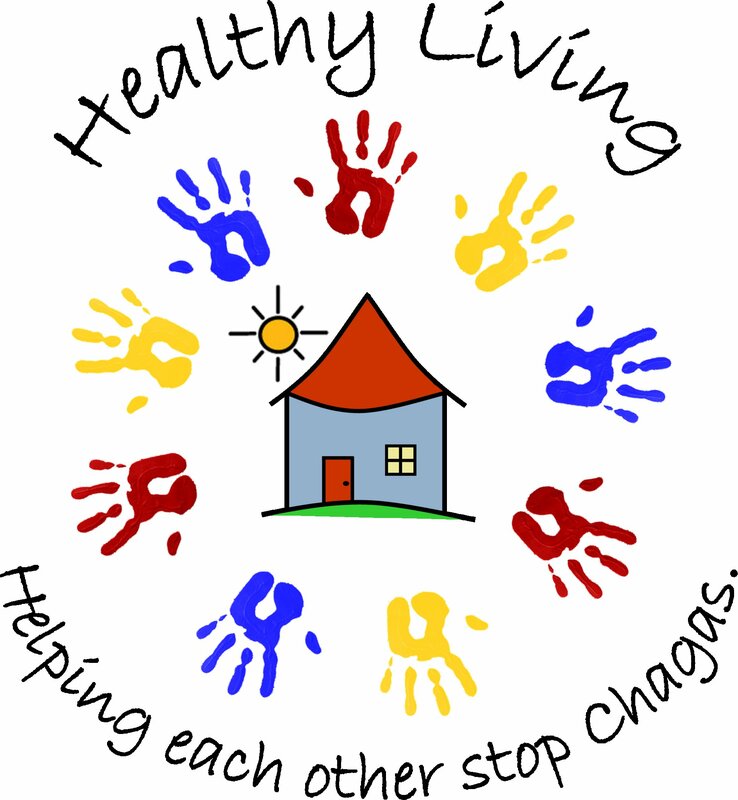 The Healthy Living Project is a long-term initiative that aims to support the socioeconomic development of rural communities affected by Chagas disease in the province of Loja in southern Ecuador. 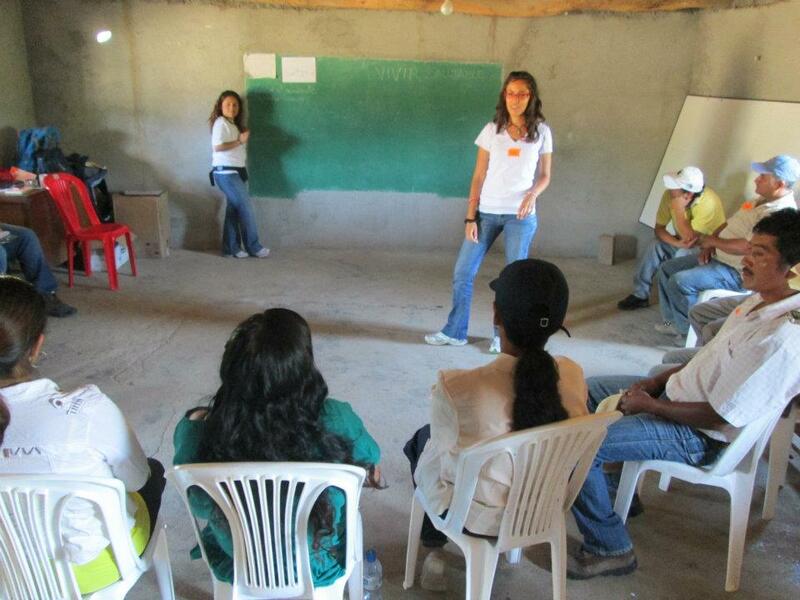 With a holistic approach, this public health strategy looks to prevent the transmission of Chagas and other diseases “associated with poverty” by facilitating participatory processes of human development that are sustainable and sustained by the people involved. 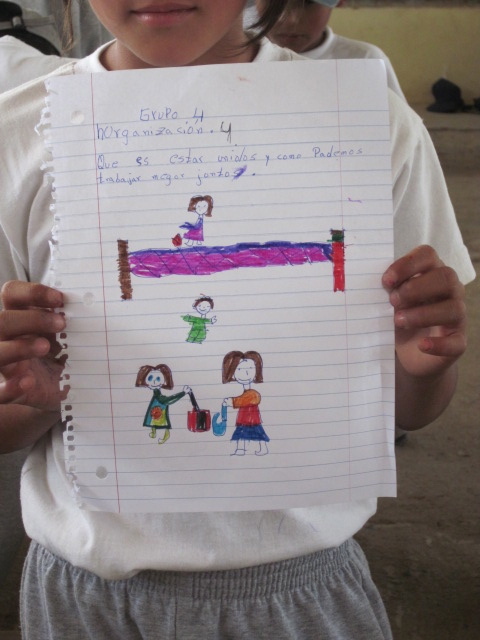 The Healthy Living Initiative is actually working in Southern Ecuador, specifically with the communities of Guara, Bella Maria, and Chaquizhca, in Calvas County, Loja province. All of these communities were highly affected by the presence of chinchorros (insect vectors of Chagas disease). 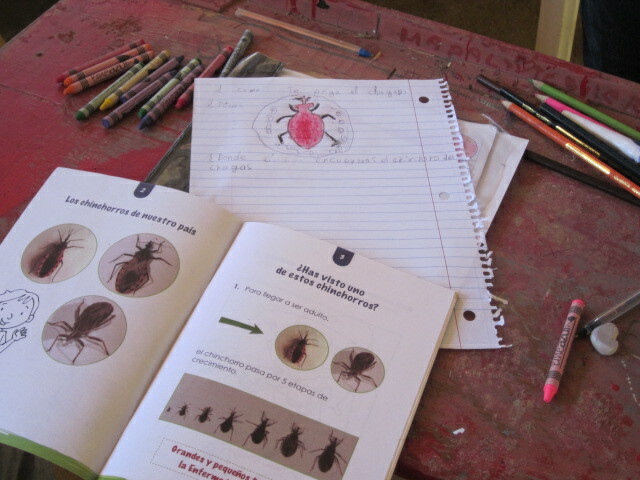 Over the last 10 years, Dr. Grijalva, Director of Tropical Disease Institute at Ohio University, has been working constantly on the initiative against Chagas disease as well as Healthy Living project, which include the organization of study aboard program for students of multidisciplinary backgrounds. There have been hundreds of students coming to Loja province and working on the field with the communities in both scientific and social researches. The project has been so far involving with six components of health, security, housing, education, and economic development. The comprehensive and community-involved perspectives are the main factors contributing to the effectiveness and exhaustiveness of the project.